Researchers at Laboratoire Kastler Brossel (LKB) in Paris have broken through a key barrier in quantum memory performance. Their work has enabled the first secure storage and retrieval of quantum bits. Physicists at LKB have more than doubled the efficiency of optical qubit storage—from 30 percent to close to 70 percent—making secure storage and retrieval possible. Quantum memory is essential for future quantum networks. 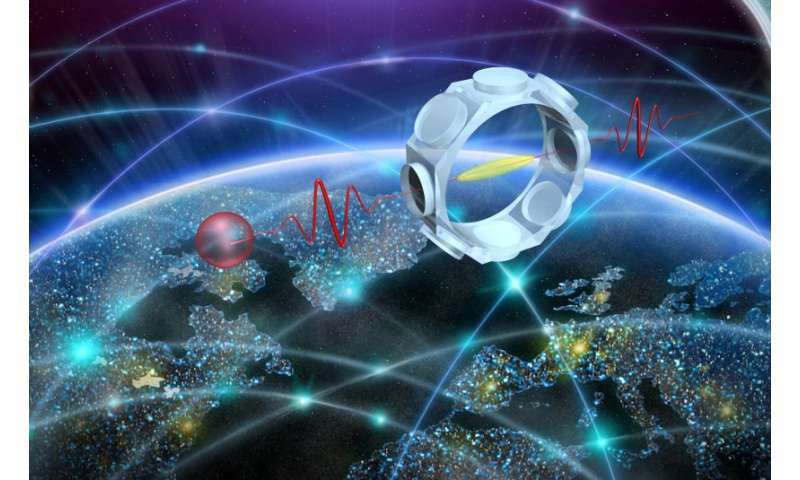 The ability to synchronize quantum bits has applications in long-distance quantum communication protocols or computing algorithms. With efficiency at well over 50 percent, quantum storage now enables protocol security. "The achieved efficiency can boost quantum network scalability and it also paves the way to advanced tasks where the efficiency plays a critical role, such as in certification protocols or unforgeable quantum money," says Dr. Kun Huang, a postdoctoral fellow and a lead author of the study. "This device can now be at the heart of many challenging investigations for quantum networks." In the recent years, quantum memory has been implemented in a variety of materials, such as ions, crystals and cold atoms, which enable the control of the interaction between the information carrier, usually a photon, and a physical medium for storage. However, no memory has been able to store and retrieve a qubit at a success rate over 30 percent until now. In the January 25th online issue of Nature Communications, Prof. Julien Laurat and his team at the LKB, part of Sorbonne University and the CNRS, reported that they have stored optical qubits with a record efficiency of 70 percent, while preserving a fidelity to the input qubit beyond 99 percent. "We selected a number of key elements and were able for the first time to combine them in a single setup. This work was key to achieving the highest efficiency to date for the storage and readout of an optical qubit," says Pierre Vernaz-Gris, a former doctoral student who performed the experiment and one of the two lead authors of the paper. The experiment involves the conversion of a photonic qubit into an atomic excitation of laser-cooled cesium atoms. With the protocol of electromagnetically-induced transparency, a control laser beam makes the medium transparent and slows down the impinging signal light carrying the information. When the signal is contained within the ensemble and the control beam is turned off, the information is converted into a collective excitation of the atoms, which is stored until the control beams is turned on again. This technique, mastered at LKB, has already been used for quantum memory experiments in the previous years, but the efficiency of the process greatly depends on the number of atoms involved in the interaction. Laurat's team therefore prepared a very elongated cloud of ultracold atoms (almost three centimeters long), which enabled efficient storage. The breakthrough came when the research team was able to do spatial multiplexing of the compressed atom cloud. The LKB succeed in obtaining both efficient storage and spatial multiplexing concurrently, in addition to a high signal-to-noise ratio. This demonstration follows other works that Laurat's group has done in recent years, including the realization of a multiple-degree-of-freedom quantum memory or the initial demonstration of stopped light in an optical fiber. That quantputer will be ours in a few years or less. Shortly afterward, the increased computing power and capacity will be able to exactingly model high temperature superconductivity and stability in magnetoelectoconducting fluid along closed conduits to make extremely current dense conductors to carry output from the aneutronic fusion reactors the above enabling technologies will in turn make doable physically and then economically.....and later reduce the size to enable fusion rockets based on the Bo-H fusion. Magnetohydroelectrodynamic beams from that reactor can both yeild electric power in great abundance but also a rocket very capable of a=d^2S/dt^2=1grav unit.....forever. The stars will be ours to settle. Like Proxima Centauri and its habitable planets.